The normal tympanic temperature is usually 0.3–0.6°C higher than an oral temperature (OER #1). It is accurate because the tympanic membrane shares the same vascular artery that perfuses the hypothalamus (OER #1). 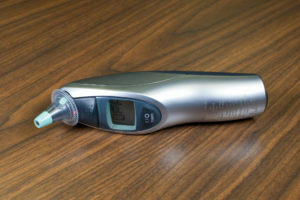 A tympanic thermometer is shown in Figure 2.4. Remove the tympanic thermometer from the casing and place a probe cover (from the box) on the thermometer tip without touching the probe cover with your hands. Only touch the edge of the probe cover (if needed), to maintain clean technique. Turn the device on. Ask the client to keep head still. For an adult or older child, gently pull the helix up and back to visualize the ear canal. For an infant or younger child (under 3), gently pull the lobe down. The probe is inserted just inside the opening of the ear. Never force the thermometer into the ear and do not occlude the ear canal (OER #1). Only the tip of the probe is inserted in the opening – this is important to prevent damage to the ear canal. Activate the device; it will beep within a few seconds to signal it is done. Discard the probe cover in the garbage (without touching the cover) and place the device back into the holder. See Figure 2.5 of a tympanic temperature being taken. The technique of pulling the helix up and back (adult) or the lobe down (child under 3) is used to straighten the ear canal so the light can reflect on the tympanic membrane. If this is not correctly done, the reading may not be accurate. The probe tip is gently inserted into the opening to prevent damage to the ear canal. The ear canal is a sensitive and a highly innervated part of the body, so it is important not to force the tympanic probe into the ear. The tympanic temperature method is a quick and minimally invasive way to take temperature. Although research has proven the accuracy of this method, some pediatric institutions prefer the accuracy of the rectal temperature. The Canadian Pediatric Society found equal evidence for and against the use of tympanic temperature route (Leduc & Woods, 2017). It concluded that tympanic temperature is one option for use with children, but suggested using rectal temperature for children younger than two, particularly when accuracy is vital. The tympanic temperature is not measured when a client has a suspected ear infection. It is important to check your agency policy regarding tympanic temperature. Tympanic Temperature by Ryerson University is licensed under a Creative Commons Attribution 4.0 International License, except where otherwise noted.